Home > Ornaments by Artist > Robert Chad > 2012 Mary's Angels Heavenly Harmony - *Magic - Hard to Find! 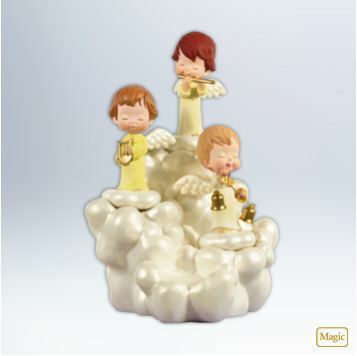 2012 Mary's Angels Heavenly Harmony - *Magic - Hard to Find! A unique, interactive, Musical table top piece. Press an angel to start one of three favorite Christmas carols. Press other angels to add or remove their instruments from the melody. Place the 2012 "Sterling Rose" Mary's Angel ornament (sold separately) in the open space to add a special vocal performance. Battery Operated: Uses 3 AAA batteries (Not included). To buy replacement batteries, click here. Great customer service! I had to return the first one because it didn't work. I called customer service and they sent a working one right away with a prepaid return label. The second one works great, beautiful cheerful singing. My friends and family love it, plus it is super cute. This is a really nice piece, table top size, to complement the series. The music is very pretty and each angel plays her own song plus they all play together. Great price with quick and safe shipping.